I often find myself bleating on about how wonderful microbes are – & that we should all embrace them & live in harmony with them, like one big happy family. That’s mostly true, the vast majority of microbes that live on, inside & around us pose no major problem to us humans, & many are often super-helpful. But crikey – there are some seriously scary microbes out there too, here’s a reminder of just a few devastating human diseases caused by some of the nastiest microbes! I’ve just scoured through some statistics & medical history sites to find this info, the death numbers & years do vary a little from site to site, but as unbelievable as they sound – these should all be pretty close. VIRUS: Spanish Flu – This flu is estimated to have killed approx 50 million people worldwide, from 1918-19. This massive outbreak occurred 100 short years ago & killed many, many healthy young adults (strangely, you were more likely to survive this one as a baby / child or elderly person – typically more vulnerable due to their underdeveloped or compromised immunity). The flu actually killed more of the American army in world war one than were killed in battle. The ‘Spanish flu’ was called that because during war time, news of the spread was suppressed by warring countries, but neutral Spain reported freely – creating an illusion that it was worst affected. Just imagine next years’ flu outbreak killing 50 million people! If it occurred in this day & age, a virus this virulent could potentially kill many millions more, because it would spread much faster & wider, given the ease & frequency of international travel. Our improved modern day communication, sanitation & medical care would mean that we’d have more chance of containing, treating & controlling it, though we’re nowhere near as good at controlling viruses as we are bacteria. This type of pandemic could absolutely happen again, all it takes is a viral mutation & a few travellers to get it going. BACTERIA: The Bubonic Plague Epidemic of the 14th century. Again – estimated to have killed approx 50 million people, which was at the time around 60% of Europe’s population! This was caused by a bacteria (Yersinia pestis) that was transmitted to humans by rat-flea bites. Starving fleas would jump onto humans when their rat hosts died from the disease. 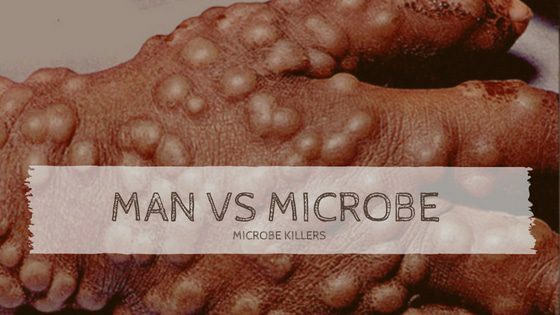 This microbe still infects people today, & infection is most prevalent in Africa. The disease thrives in warmer seasons (as fleas do), & during the pandemic, European winters slowed the spread considerably, until the next Spring / Summer outbreaks. VIRUS: Smallpox – The Variola virus is thought to have killed around 300 million people between 10,000 BC & 1979. It’s now been completely eradicated by mass vaccination since 1979 (the only human disease considered to be completely wiped out this way). Smallpox was a massive killer worldwide but proved particularly devastating to native aboriginal populations in countries like Australia & the USA. When Europeans first settled these areas, they brought the disease that they had some level of immunity to with them, the natives had no previous exposure & no immunity whatsoever. Up to 70% of the aboriginal population living in the Sydney area & beyond, are thought to have died from smallpox, not long after the arrival of English settlers. There is some controversy around how the illness started its spread among the Australian natives. VIRUS: HIV/ AIDS – From 1981 to the present day, approx 40 million are estimated to have died, while over 35 million still live with the disease. Africa is thought to be where AIDS originated & is worst affected. The disease itself isn’t what kills people, it is the compromised immune system that results which allows other illnesses like TB & pneumonia to take hold & become lethal. Treatment of HIV with antiretroviral medications slows the progression of disease but there are some unpleasant side effects. Life expectancy of those living with HIV has risen dramatically with advances in treatment, though not all have access to this. VIRUS: Measles – 700BC present day. According to the WHO, measles is thought to have killed upwards of 200 million in this time, it was actually still killing 100,000 people annually until 2016 (when fatalities dropped below this figure for the first time). It remains one of the biggest killers of young children worldwide, though rates of infection have dropped drastically since 1963 when a vaccine was introduced & mass vaccination campaigns were started. Before the vaccine, almost 100% of children would get measles before their 18th birthday, & parents would often choose to expose children when at an optimum age. Today, children most at risk of serious measles infection are those under 5yrs, who are malnourished & living in poverty. Vitamin A status is particularly important for children & timely supplementation can apparently decrease death rate by around 50%. The disease is very rare in Australia now, probably due to a combination of widespread vaccination & better nutrition, hygiene, general health, living conditions & overall immunity. Vaccine safety & efficacy is controversial in Australia (& in many other developed countries), where measles poses minimal threat. BACTERIA: – Mycobacterium tuberculosis is thought to have killed over 1 billion people in the past 200yrs. TB is the clear infectious disease ‘winner’ when it comes to total human deaths & survival into the modern age. Approx 25% of the current world population is infected, but not all will become ill – the bacterium can be latent, & mainly becomes ‘active TB’ in the immunocompromised (it kills many with HIV). TB thrives & spreads where people are living in poverty, with stress, poor sanitation, overcrowding, poor housing, lack of nutrition & other illnesses all contributing to vulnerability & spread. Indonesia, China, The Phillipines, Pakistan, Nigeria & South Africa are all hotspots. According to the WHO website, it still kills 4,500 people every day, & there are now multi-drug resistant strains emerging, meaning previous antibiotic treatments are becoming ineffective. So…microbes – they ain’t all friendly! It’s amazing to think how powerful these teeny tiny creatures can be, & humbling to think that with all of our scientific advances & tech developments, a simple microbial life form still has the potential to wipe out a massive chunk of our human population (or maybe all of us) one day. We’ll always be vulnerable to these little guys that we share earth with, they never stop evolving & changing. Looming antibiotic resistance is a huge concern facing our medical system, with fears that we’ll end up almost ‘back where we started’ before their invention. Reading about these deadly microbes makes you wonder what our next major microbial challenge might be? Obviously there’s no point stressing out & losing sleep over it (that will just compromise your resistance), the best thing you can really do is look after your immune system & maintain your health to the highest level possible, so you are robust enough to have a fighting chance to fight whatever comes your way.